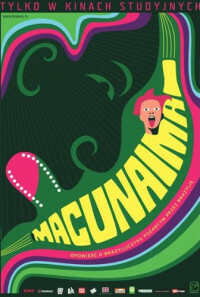 Macunaíma is a lazy anti-hero born black in Amazonas. After the death of his mother, he moves with his two brothers to Rio de Janeiro, but along his journey, he baths in a fountain and becomes Caucasian. Once in Rio, he incidentally meets the killer guerrilla woman Ci, who wears an amulet made of stone, and they fall in love for each other. They live together and a couple of months later, Ci delivers a black baby. While carrying a bomb for a terrorist attack in the stroller, the bomb explodes and Ci and the baby die, and the amulet vanishes. A very strong man finds the stone and Macunaíma tries to recover it. In the end, he returns to the jungle. Regions are unavailable for this movie. Click the "Watch on Netflix" button to find out if Macunaima is playing in your country.